If you want to know how the biggest water fight of the world looks like, then it is better to decide about to visit Thailand for Songkran Festival because you can find much fun there. 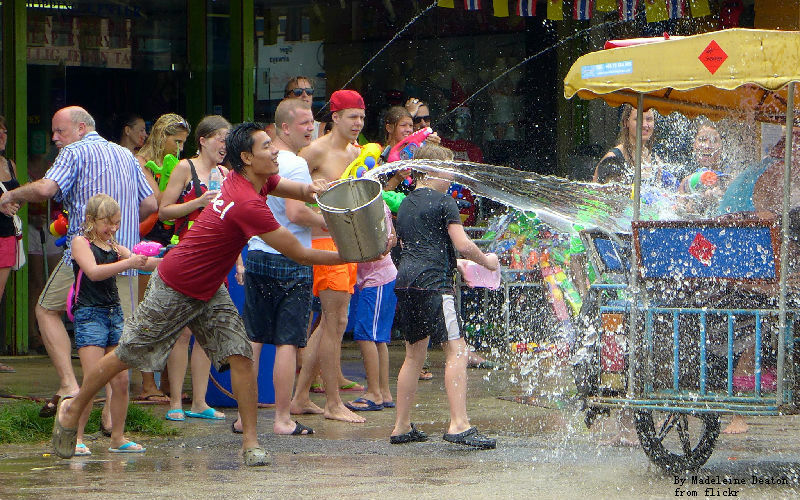 Water fight during the celebrations of Songkran can be the best thing to enjoy for everyone. Traditionally, it is being considered that flow of water can clean the sins of everyone at the start of a new year. With the passing time, it is heightened into a wet event. If you are visiting Thailand during the celebrations of Songkran, you have to control your temper. You can't get angry, and it is better to keep smiling. You have to respect your elders there. It is because during the celebrations of Songkran it is a part of their tradition to respect the elders there. If you have accommodation near Khao San road in Bangkok, then you have to be patient due to the heavy crowd there. If you are planning to visit Thailand for the celebrations of Songkran, it is better to book the hotel or any other place where you want to stay during your visit to Thailand. Your selection of accommodation place may depend on your decision of where you want to enjoy the celebrations of Songkran. Hotels can be booked early during this session. during the celebrations of Songkran, you can't go out and come back without being soaked. If you don't want to be wet, it is better to hire a taxi for even a small tour too. It is because hiring a taxi can save you from water pumps, but if you are going to get a tuk-tuk, you may not be going to stay dry anymore. If you do not want to be a part of water fights, it is better to stay inside and have enough activities and food stock for 3 to 4 days to enjoy. But if you do not want to stay inside, then there are high chances of you getting soaked. It is not an uncertain thing that you are going to be soaked when you are at the celebrations of Songkran. So, it is better option to enjoy the celebrations after being dressed up properly. A proper dressing according to the event can never lead you to an awkward moment. Do not wear a white dress for this event and wearing a swimsuit can be a better idea for the celebrations of Songkran. Try to avoid the use of thick fabric it is because they are going to be uncomfortable and heavy when wet. Do not forget to put swimming goggles, because water outside is not very clean. Direct water stream can affect your eyes. If you are going out during the celebrations in your car, then it is better to move on main roads. Washing your car during the celebrations may become meaningless. It is because, during this period wherever you are going to move, your car will be plastered with the paste. So, make your windscreen wipers topped up with heavy water because you have to use them often. Do not forget to lock the doors of your cars while driving. Movie theaters and shopping malls are not going to be closed during the celebrations of Songkran. So, these places can be used as a shelter. While traveling through public transport, it is better to use air-conditioned bus or Taxi for safe travel. Skytrain or skywalk can be a better option to avail during the event of Songkran. It does not mean drinking water at all, because you have to buy that necessarily. It means the amount of water required to refill the water guns or pistols that you have. It is because you can find huge containers full of water on roadsides. These containers are being shared by the locals there. You can get free water from more than 95% of these containers easily. If you want to capture the amazing memories, you have to use the waterproof camera or take a plastic bag with you to save your camera from water. Applying wet powder on the face and clothes of other is known as blessing there. But avoid wet powder because, not everyone there has clean hands, and you can look like acne plagued person after a few days of celebrations. If you are thinking about to enjoy the water fight and want to be a part of that, then it is better to use plastic bags for your valuable things to keep them safe from water. You can buy plastic bags from the shops around you easily. Be sure about the fact that you are using clean water to enjoy there. Pouring clean or cold water can't be a problem but pouring water with hard ice can cause a problem. So, it is better to enjoy in a way that no one is going to be hurt by your problem. It is not necessary that water fight can only be done from 13 to 15 April. It can last for longer too. You can enjoy the world's biggest water fight in the best way by adopting all the above precautions. Try to enjoy the celebrations at most. And collect great memories that can last forever. 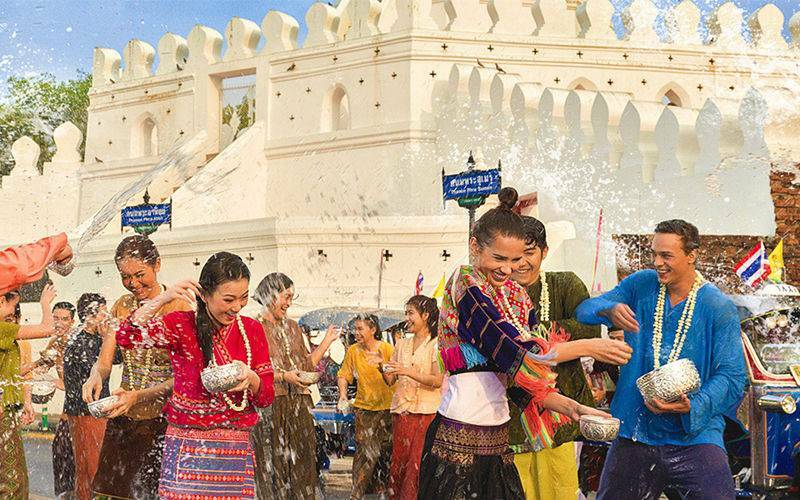 As the Thai New Year, Songkran Festival also witness the milling crowd of locals and visitors. If you want a more pleasure Thailand tour, feel free to inquiry us to tailor-made Thailand tour. All your requirements will be satisfied with private guide and driver. Look those popular tours for inspiration.